Birds in Tasmania: Visit from an Escapee! Interesting post we think it may be a Female Rose-ringed Parakeet (Psittacula krameri)Widespread resident of Indian Subcontinent.Green head and blue-green tip to tail. Male has black chin stripe and pink collar. Ref Pocket Guide to the Birds of the Indian Subcontinent. Yes, I think you're quite correct. The lack of colouring has made it more difficult. Looking at Forshaw's "Parrots of the World", I think I should have looked closer at the size of the bird. 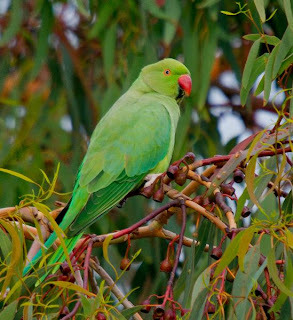 The Alexandrine's is somewhat larger, although guessing at the size of birds in the field, can be a challenge. Thanks for the info..